A round-up of the best books on the Spanish Civil War, both fiction and non-fiction, to mark the 80th anniversary of the outbreak of the conflict. Our round-up of the best new and classic books on the Spanish Civil War, both fiction and non-fiction. The civil war that tore Spain apart between 1936 and 1939 and attracted liberals and socialists from across the world to support the cause against Franco was one of the most hard-fought and bitterest conflicts of the 20th century: a war of atrocities and political genocide and a military testing ground before WWII for the Russians, Italians and Germans. A vivid and authoritative account of the Spanish Civil War and the rise to prominence of General Franco. No modern conflict has inflamed the passions of both civilians and intellectuals as much as the Spanish Civil War of 1936–39. Burned into our collective historical consciousness, it not only prefigured the imminent Second World War but also ushered in a new and horrific form of warfare that would come to define the twentieth century. At the same time it echoed the revolutionary aspirations of millions of Europeans and Americans after the painful years of the Great Depression. 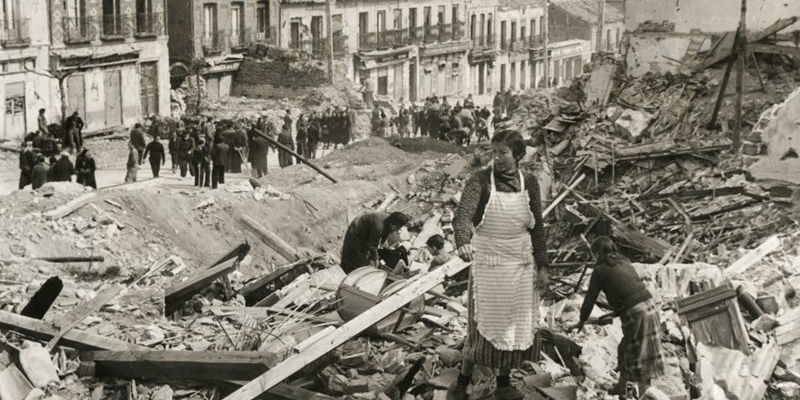 From the moment it began in 1936, the Spanish Civil War became the political question of the age. Hitler and Mussolini quickly sent aircraft, troops and supplies to the right-wing generals bent on overthrowing Spain's elected government. Millions of people around the world felt passionately that rapidly advancing fascism must be halted in Spain. More than 35,000 volunteers from dozens of other countries went to help defend the Spanish Republic. Adam Hochschild evokes this tumultuous period through the lives of these volunteers. A few are famous, such as Ernest Hemingway and George Orwell, but others are less familiar. They include a nineteen-year-old Kentucky woman, a fiery leftist who came to wartime Spain on her honeymoon; a young man who ran away from his Pennsylvania college and became the first American casualty in the battle for Madrid; and a swashbuckling Texas oilman. Drawing on newly discovered material from the Spanish, Russian and German archives, Antony Beevor's account narrates the origins of the Civil War and its violent and dramatic course from the coup d'etat in July 1936 through the savage fighting of the next three years which ended in catastrophic defeat for the Republicans in 1939. He successfully unravels the complex political and regional forces that played such an important part in the origins and history of the war. What was it that roused left-wing sympathizers from all over the world to fight against Franco between 1936 and 1939? Why did the British and US governments refuse to intervene? And why did the Republican cause collapse so violently? Hugh Thomas's classic account offers a full and vivid analysis of this passionate struggle where fascism and democracy, communism and Catholicism were at stake - and which was as much an international war as a Spanish one. Orwell’s first-hand account of the brutal conditions of the Spanish Civil War. With passion and clarity, he describes the bright hopes and cynical betrayals of that chaotic episode: the revolutionary euphoria of Barcelona, the courage of ordinary Spanish men and women he fought alongside, the terror and confusion of the front, his near-fatal bullet wound and the vicious treachery of his supposed allies. 1940: Madrid lies ruined, its people starving, while the Germans continue their relentless march through Europe. Britain now stands alone while General Franco considers whether to abandon neutrality and enter the war. Into this uncertain world comes Harry Brett: a traumatised veteran of Dunkirk turned reluctant spy for the British Secret Service. Sent to gain the confidence of old schoolfriend Sandy Forsyth, now a shady Madrid businessman, Harry finds himself involved in a dangerous game - and surrounded by memories. A vivid and haunting depiction of wartime Spain from the bestselling author of the Shardlake series. Inspired by his experiences as a reporter during the Spanish Civil War, For Whom the Bell Tolls tells the story of Robert Jordan, an American volunteer in the International Brigades fighting to defend the Spanish Republic against Franco. After being ordered to work with guerrilla fighters to destroy a bridge, Jordan finds himself falling in love with a young Spanish woman and clashing with the guerrilla leader over the risks of their mission. The new novel from the million-copy international bestseller The Miniaturist, unveils the mystery of a lost masterpiece with a secret history. Their search for the old man's memories takes them deep into the heart of Spain - a country that has pledged to forget its painful past. The South is the award-winning novel that first introduced readers to Colm Tóibín. Katherine Proctor has dared to leave her family in Ireland and reach out for a new life. Determined to become an artist, she flees to Spain, where she meets Miguel, a passionate man who has fought for his own freedoms. They retreat to the quiet intensity of the mountains and begin to build a life together. But as Miguel’s past catches up with him, Katherine too is forced to re-examine her relationships: with her lover, her painting and the homeland she only thought she knew.